This page describes how to work with and update comprehensive databases on merchant electric power prices in U.S. markets. The databases of U.S. Merchant prices include regional gas prices and on-peak daily electricity prices from the EIA. Alternative graphs are displayed of prices in terms of USD/MWH and in terms of market heat rates (MMBTU/MWH). In the databases below, Electricity prices are tabulated in nominal USD per MWH terms and also relative to natural gas prices, in MMBTU/MWH. To express electricity prices relative to natural gas prices, the electricity price (USD/MWH) is divided by the natural gas price (USD/MMBTU), yielding MMBTU per MWH. The market heat rate provides a better indication of the relative price of electricity in most markets. It can also be used to gauge the profitability of a operating a natural gas plant — when the market heat rate is above the plant heat rate it is profitable to operate the plant. I have tried to go back as far into history as I possibly can for the different regions which involves taking data from different sources. The data on this page U.S. electricity prices is for day-by-day on-peak. The U.S. electricity price data can be obtained from the EIA or individual ISO websites. Tabulating hourly data from ISO websites is included in a separate webpage. In the files listed below I have tried to compile U.S. merchant electricity price data since various markets began to be published in the 1990’s. You can find day-by-day on-peak data from the EIA website (it does not have hourly detail and you cannot examine on-peak versus off-peak prices). 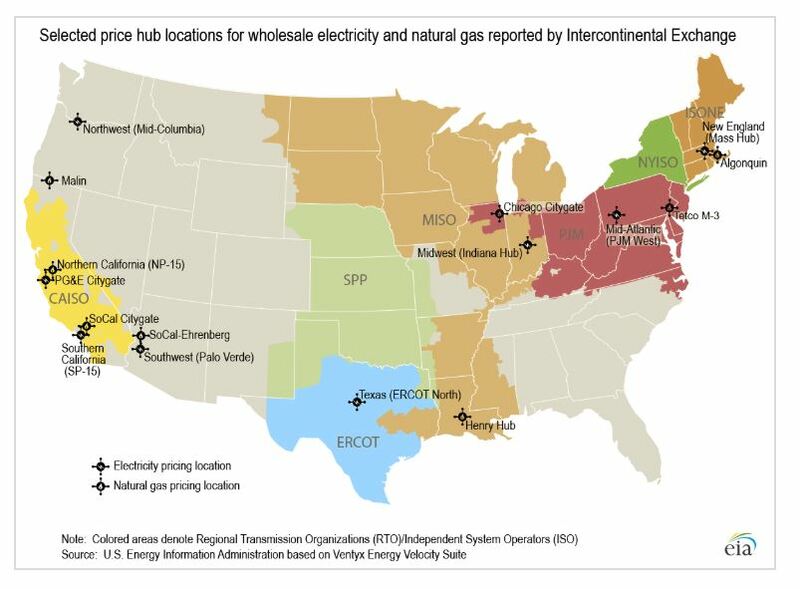 The EIA website has different regions and with a some work you can get a history of prices and it includes a lot of data on comparative natural gas prices for the different regions. The different U.S. regions for electricity price data is illustrated on the screenshot below. In the database that you can download below there are prices beginning in 1996 for the California markets; back to 1997 for the Midwest markets; and back through 1999 for the New England region. I have put together data on prices that I have complied since various markets began to be published in the 1990’s. You can go to the ISO New England, ISO New York and PJM websites and collect hourly data these days. You can also get day by day on-peak data from the EIA website (it does not have hourly detail and you cannot examine on-peak versus off-peak prices). My hope is to get the process of updating data very mechanical where you can use the old history in within about a quarter of an hour update the databases. To put on-peak prices together and update the database, you can do the following (it is pretty easy). 1. Go to the natural gas file and press the button to read the pricing at the regional hub pricing files (you only really need the files for the years after the year in the file) as well as the button to read the Henry Hub prices. You may have to add lines (copy rows) for the last lines of the various hubs. This should only take a minute or two. 2. Copy and paste the page of natural gas basis differentials to the electricity price file that is named Current EIA Format and Database — the first file below. I have kept the electricity and gas files separate to make them easier to understand. 3. Press the button to read updated prices in the electricity price file. This should be automated and not pose problems and be finished in seconds. The U.S. has many electricity markets with published prices that have now been around for a long time. The prices can be used to study many case studies including: (1) sudden spikes in the Midwest U.S. followed by lower prices for many years; (2) the California power crisis of 2000-2001 with lower hydro, high plant outages; game playing in natural gas and electricity markets; (3) depressed prices in the NEPOOL market after new combined cycle capacity was built 2001-2002; (4) declining prices in ERCOT resulting in the TXU bankruptcy — one of the largest bankruptcies in history after 2008; (5) transmission constraints and differential prices between MID-CON and California driven by renewables after 2010; and (6) increasing prices in PJM driven by retirement of coal capacity. I have tried to put all of the markets with gas and electricity prices into a single file so all of these issues can be studied. For electricity price to be relevant in valuing plants and evaluating new additions, natural gas coal and even oil prices may be relevant. The data demonstrates that U.S. natural gas market can be very different in different regions. For example, gas prices in New England sometimes reach very high levels because of limited natural gas pipeline capacity at something called the Algonquin hub. Not too far away in Pennsylvania, the gas prices can be very low because this is a region where shale gas is produced. The future prices in NEPOOL are therefore highly influenced by what will happen to pipeline capacity. This is the same for other markets below including the WESM market in the Philippines, the UK market; the Australian markets and the Nordpool market. MsgBox "Deleting Sheet to re-create"